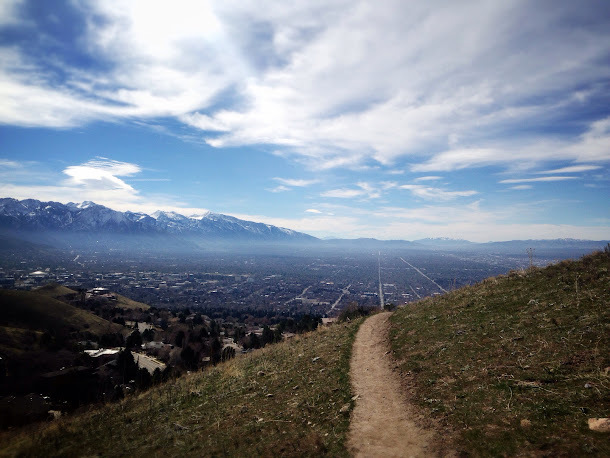 The Bonneville Shoreline trail, taken just a few minutes before my 2nd (!!) fall. Currently... despite my swollen knuckles and lingering hand pain from my fall, I'm excited to get back out on the trail this weekend as it's supposed to be BEAUTIFUL and 64 degrees on Sunday (sorry to rub it in, East Coast). Currently... looking forward to tonight and my first adult beverage in over a month! Since I'm not introducing gluten back into my gut just yet, my drink of choice will be a nice big glass of red wine from this winery. Is it 5PM 4:30PM yet?! Currently... also looking forward to watching the finale of Breaking Bad tonight. We've been limiting ourselves to one episode a night this week so that we didn't finish the series mid-week. So now our Friday night will be spent watching what becomes of Mr. White. All with a glass or three of that red wine. Party animals over here! Currently... feeling a bit frustrated with how potty training with Alice is going. Earlier in the week she was stoked to be wearing underwear and even went pee-pee in the toilet (did I really just say pee-pee?!). But yesterday and today she gives a resounding NO! when putting on underwear or using the potty is even mentioned. So we're back to square one and I'm not pushing the issue. Plus I know she's still on the young-side. Any advice? And currently... can't believe I'll have a two-year old in just over a week! Two-going-on-twelve with the attitude and drama this kid has been giving me lately! What are you currently doing? Any fun plans for the weekend? Other than our Breaking Bad date and priming the bathroom for paint, we're pretty much without plans. Weekly Workouts: Monday - Family run! 4 miles/?? min. Tuesday - Rest day (my hand was/is still really painful and swollen from my falls). Wednesday - Run! 1-mile warm-up, 8 x 200m hill repeats (6% grade), 2 x 50 walking lunges, 1-mile cool-down. Thursday - My hand finally felt well enough for CrossFit! Skill: Bar muscle-ups (ha! ), then front squat 25 reps (65lbs... No hip pain), then 3 RFT of: 750m row + 30 sit-ups + 20 KB swings (35lbs) + 10 dips (blue band). Friday - Skill: Pistol practice, then 5RM strict press (65lbs). WOD: 14.3 (dead lifts and box jumps) Rx to 155lbs (79 reps). Both of my girls took two rounds of potty training to make it stick. The first one was getting used to the potty and it's purpose, and having some good visits but so many accidents that it became not worth it. The second round was about 2 months later and would always be much more successful. We would allow the girls to use the potty whenever they wanted to but diapers not left on. We also used a sticker chart, where they got to put a sticker on a poster board for every time they went pee, and yes, we used m&ms too. 1 for every pee. Not a fan of bribery but it worked. Good luck and don't be too hard on her or yourself. My oldest potty trained at 28 months (first try at 26) and the little one started trying at 28 months and was successful at 30 months. Back off on the potty learning. Nolan thought going pee on the potty was super fun from months 20-23 or so. He lined up his stuffed animals and "showed" them. He even clapped for himself. He turned two and just wasn't interested anymore. I offer throughout the day, and he says "no" most of the time. I bribe with stickers, but even then, he usually says no. There seems to be no reason to push it, IMO. When he is ready, he will let me know, I figure. I hope your wine was yummy! I don't know how you're limiting yourself to one episode of Breaking Bad each night. We are on episode 12 (final season) and stayed up way, way too late last night. I was ready to pull an all nighter to finish up. I'm dying to know what happens!!!! I love spending weekend time enjoying the end of a really great series. Last week we binged on True Detective and finished the final two episodes Sunday night. I hate that so much my time with Devon revolves around screen time, but with my energy levels these days it's nice to just sit and enjoy some passive entertainment. Hope you enjoyed your finale night! I miss that show from time to time!